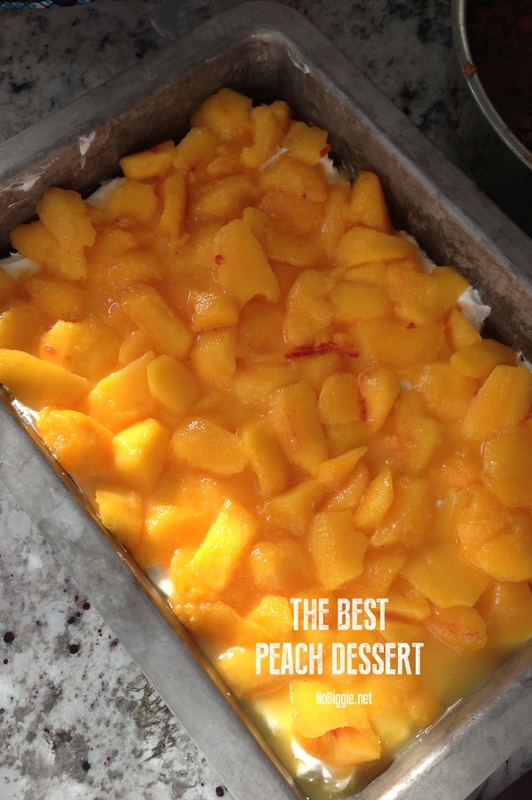 We call this the BEST Peach Dessert…because we really think it’s the Best! 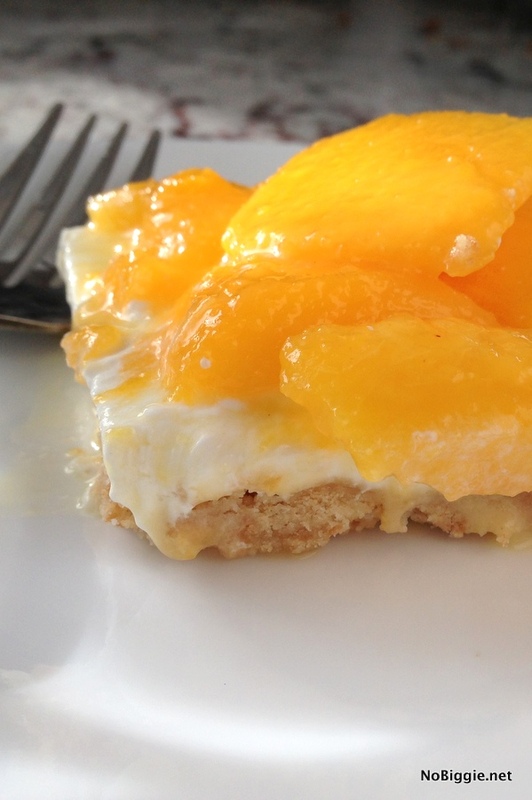 When peaches are in season, you have to make this! Everyone will want seconds, it really is a crowd pleaser. I love to stop at our local produce stand and pick up a bunch of peaches every chance I get. They’re just so good. 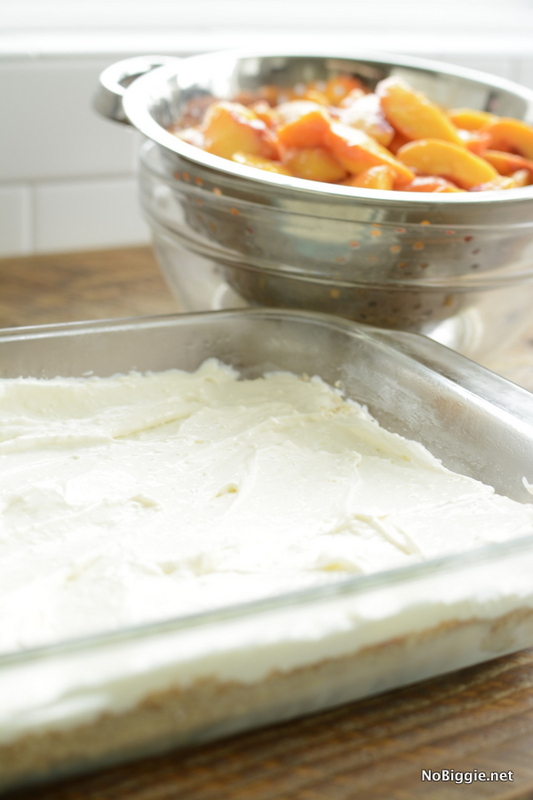 This simple fresh peach dessert is a family favorite. This recipe comes from one of my Mom’s good friends. I’m so happy she shared it with us years ago, because it’s a keeper! 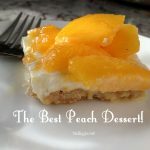 With a buttery cookie crust, fresh peaches and a delicious glaze over the top, this really is the best peach dessert. Peel and slice all the peaches. To avoid too much excess liquid in the top layer of this dessert (the peach layer), place the peeled sliced peaches into a colander inside a larger bowl, to allow the peach juices to drip out. Reserve the juices. Chill the peeled sliced peaches in the fridge until ready to assemble. In a medium sized sauce pan, bring to a boil the reserved peach juices, orange juice concentrate, sugar, cornstarch, vanilla and almond extract. Let this sauce thicken and cool. In a large bowl, toss the cooled sauce with the 6 cups of sliced peaches, allowing excess liquid to drip out. Mix the melted butter with all of the crushed cookies, and press into a 9x13in. pan. With a handheld mixer, mix the cream cheese with the powdered sugar and cool whip. Spread the cream cheese layer over the cookie crust. Cover the dish with plastic wrap and chill for 3 hours or overnight. Add the peaches layer on top. Serve chilled. Optional: You can chill the top layer separate from the two bottom layers. Just add the peach layer right before serving, to help keep the cookie crust from getting too soft from any excess liquid. Oh it’s so good! Perfect for peach season. *Please note – To avoid too much liquid in the top layer of this dessert (the peach layer), place the peeled sliced peaches into a colander inside a larger bowl, to allow any excess liquid to drip out. Reserve the liquid to be added back into the sauce at a later time. *A few readers mention that they had issues with the top layer (the peaches layer) being too runny, too much excess liquid. Here are a few solutions: Let any excess liquid from the peaches drain out before adding the glaze. You can also increase the amount of cornstarch in the glaze, and you can also boil the glaze a little longer to help it thicken up before adding it to the peaches. Wishing you all success with this delicious recipe. Wow. I have tons of peaches right now, and who doesn’t love Pam York? I’ll have to try this! Thanks, Kami. Hi Paige! Yes! It’s a good one! Your family will love it! Enjoy! Oh my gosh, I can’t find a single part of this that isn’t just totally dreamy! I’d love to try it with other yummy fruits too! You will LOVE it! Thanks Heather! This taste INCREDIBLE but…my top layer is a soupy mess. Maybe the directions could’ve said let boil for ?? minutes to thicken (instead of: bring to a boil) or maybe my peaches were extra juicy and that’s why it didn’t work! Yummy just messy! Oh shoot! Glad it tasted good! Sorry it was so messy! Maybe less juice?? It’s hard to put a time on it since it will always vary. I hope you have better success when you make it again. Not sure, you could try?? Thanks for your reply may just break down and peel fresh peaches. I just made this, I cheated and used peach pie filling for the top layer. It’s chilling in the fridge right now and looks awesome!! Yay! I’m so excited! You will love it! I just made this today for a dinner party. It was delicious and everybody loved it. One of my guests even said that he thinks he found his new favorite dessert. I boiled the sauce for at least 20 minutes and added a little extra corn starch and it was nice and thick. Thanks for the great recipe! I adjusted the glaze for the peaches because I read people’s comments so that part wasn’t a problem. But I was wondering if the recipe was supposed to be 1/2 CUP of butter instead of 1/2 STICK of butter. My cookie crumbs didn’t really stick together. I even tried to help the binding process by baking the crust for about 10-15 minutes in a 350 degree oven. All other parts of this recipe were great. Despite my crumb-y crust, everyone still loved this! Thanks! Just made this and wanted to tell you I changed a few things…added more melted butter than called for to help bind the oreo’s…I used all oreo’s and used the chocolate ones. I also chopped up some of the fresh peaches and added them to the cream cheese mixture. I boiled the sauce for about 10 minutes and added a bit more cornstarch than called for to be certain it would be thick enough. Then when I mixed the sauce with the peaches, I also added about 3/4 cup blueberries to it. It looks beautiful and I’m betting it’s going to be delicious! Thanks for the recipe, even though I chose to tweek it a bit! This recipe is horrible! Absolute runny mess! It’s like the peaches bled all over the middle layer. Definitely not making the disaster again! A bit harsh Brooke. You certainly don’t need to be so rude when leaving feedback. Try CONSTRUCTIVE CRITICISM….just a thought. I’ve not made this with your recipe’ but like the idea. Instead of packaged cookies, I’ll make my own nut shortbread, use the middle layer as directed, then chill. I’ll serve with fresh sliced peaches. Why would I want to put anything on them? Fresh peaches are perfect just the way they are. They don’t need cornstarch and frozen OJ. Thanks for the idea. We picked peaches this afternoon! I made this recipe and instead of 2 cups of water I used peach juice 2 cups and as for the corn starch i added another 1 1/2. Tsp. It turned out great !!! This looks so good. I can’t wait to try it at our Labor Day family get together. Thanks for sharing the recipe! Can you use real whip cream? I don’t use cool whip. Looks so yummy! sorry for a late reply! Or course you can! Sounds good. Can’t wait to try it. Do you use the middle part of the Oreo for the crust as well as the cookie part? Easy to just drain the peaches before putting them on top. I think the juice mixture is to keep the peaches from browning, more than anything else. I had really perfect peaches, and this was a great way to enjoy them.